Wander climbs a colossus in Shadow of the Colossus. It's a feat practically as old as storytelling itself: the daring hero climbing up the body of a towering monster to deliver the killing blow. Over the years, tabletop RPGs have developed different ways to represent this stunt, but both Pathfinder and its ancestor Dungeons & Dragons have both struggled to provide rules for characters to emulate this heroic act. My inspirations for this article stemmed from two sources. One was Dragon Magazine issue #306, which included an article called "Power Fantasy" by JD Wiker. In this article, Wiker presented rules for "cinematic combat" like swinging from a chandelier and throwing an opponent. These were elements I'd always wanted to include in a game, yet found the core rules of d20-based games lacking in representation of them. 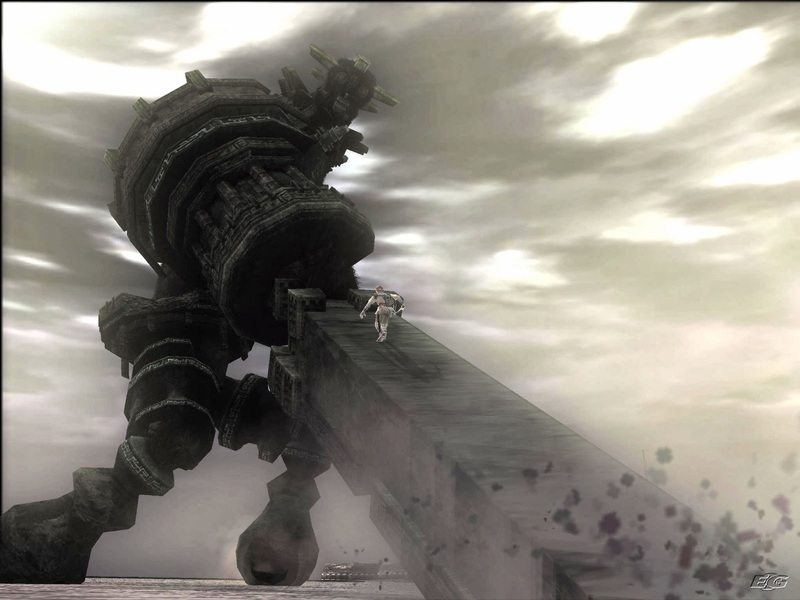 The second inspiration originated roughly around the same time; a video game published by Level-5 called Shadow of the Colossus (also known as Wander and the Colossus in Japan.) In Shadow of the Colossus, the hero was a boy and his horse who traveled together across a vast countryside in search of colossi to take down by climbing, running and vaulting all over them to strike at the vulnerable points in their stony armor. Evoking the feeling of Shadow of the Colossus is easy in Pathfinder, thanks to the universal Combat Maneuver Defense rules. This simplification of the old opposed roll checks from 3.X D&D makes it a simple matter of making a single check to perform a list of combat maneuvers. Below I've outlined a new combat maneuver called a Combat Climb, allowing characters to spring into action and clamor up and around on gigantic opponents. With Bestiary 4 out now, introducing the titanic Kaiju creature subtype, this sort of cinematic combat is delivered right on time. Feel free to share your own stories of characters successfully (or unsuccessfully) battling atop gigantic, moving beasts in the comments section below. You may can climb on the back or other parts of a creature at least two size categories larger than you. You gain a +2 bonus on attack rolls against the creature being climbed and the creature is considered flat-footed against your attacks. Initiating a climbing attack on a creature is a special full-round action. In order to perform this maneuver, a you enter a creature’s square (potentially provoking an attack of opportunity for the movement, unless the character makes a successful Acrobatics check against the target's CMD). Once the movement has been made, you then make a Climb check against the target's Combat Maneuver Defense. At the end of this full-round action you may make one melee or ranged attack at your highest attack bonus. Climbing requires at least one free hand used to maintain the climb. Each round you remain on the creature, you must make an Acrobatics or Climb check (your choice) as a move action against the creature's CMD to remain climbing. A creature may spend a full-round action on its turn in an attempt to shake you off, forcing you to make an additional Acrobatics or Climb check as if you began the round on the creature. If you are knocked off, you fall prone in an adjacent square (use the grenade-like weapons table to determine the direction you fall in) and take falling damage accordingly. Benefit The targets of your combat climb no do not get their size bonus to their combat maneuver defense. When performing a combat climb, you may maintain the maneuver as a swift action. Benefit When performing a combat climb on a creature, you automatically confirm any critical threats with attacks made against them while climbing. Furthermore, you gain a bonus on all Climb or Acrobatics checks made to climb a creature equal to their size modifier. Nicely done, Robert! This captures the cinematic flavor in an interesting, balanced way. Would love to hear your thoughts on game development at some point if you ever feel like a video chat or something. Take care and keep up with interesting stuff! Thanks for the comment, Jesper, and glad to hear you're entering the wonderful world if freelancing. Don't forget to grab your +1 deadline bane battle axe at the door! I don't have a lot if time for video chats, usually, but if you hit me up on Facebook or email ill gladly correspond. Also, I'll be at Paizocon this year and am always eager to talk shop with other freelancers!